As I mentioned in my theme reveal post for the A to Z 2019 challenge, I am planning to regale my readers with stories of great achievers in the field of sports. I considered several people whose names began with the letter A for this post. Being a cricket lover, the first name that popped into my mind was Adam Gilchrist, the Australian wicket-keeper batsman who is a very well known cricketing personality. I also considered Cassius Clay aka Muhammed Ali the world-renowned boxer, whose life story is also equally inspiring. But after a lot of pondering, I decided I would begin this innings of A to Z with an article on the world famous Chess grandmaster from my own native state of Tamil Nadu, Viswanathan Anand. Anand is three years younger to me having been born in the year 1969 in the town of Mayiladuthurai in Tamil Nadu. His parents are Krishnamurthy Viswanathan, a retired manager of Southern Railways and Sushila, a homemaker, socialite and keen player of chess. Anand is the youngest of three children. He has an elder brother Shivakumar who is a manager in Crompton Greeves and an elder sister who is a professor in the United States. Anand learned the rudiments of chess from his mother Sushila at the age of six. At this point in time, Anand's family was living in Manila, Philippines. Anand was schooled in the Don Bosco Matriculation Higher Secondary School and holds a bachelor's degree in commerce from the Loyola College, Chennai. Anand was considered an average student academically. The first signs of his prodigious talent in chess came when Anand was fourteen years old. He won the National Sub-Junior Chess Championship with a score of 9/9 in 1983 followed by the Asian Junior Chess Championship in Coimbatore a year later. Again, in the same city of Coimbatore Anand won the Shakti Finance International Chess Tournament in 1988 and became India's first Chess Grandmaster. Gary Kasparov introduced a form of chess known as Advanced Chess in 1998 where a player is allowed to consult a computer to aid them in certain aspects of their moves. Anand won three advanced chess tournaments in a row in Leon, Spain. Anand is recognised as the world's best player of Advanced Chess. Anand's first victory in the FIDE world chess championships came in the year 2000 when he defeated Alexei Shirov in the finals. Anand thus became the first Indian to win the FIDE world chess championship. In the year 2006, he became the fourth player in history and the first Indian to cross the 2800 mark in Elo chess ratings. He again won the title in 2007 and became the undisputed world champion. Anand continued his winning streak and successfully defended his title in 2010 and 2012. It was at this juncture that Anand's long reign as the undisputed champion ended when he lost the title to the brilliant youngster Magnus Carlson in 2013. The championship was played in Chennai. Much earlier in October 2003, a new kind of chess championship known as the Rapid Chess tournament was organised by FIDE, the governing body of chess. In this tournament, each player was given twenty-five minutes at the start of the game with an additional ten seconds after each move. This tournament was conducted in Cap d' Agde. Anand won this tournament easily, ahead of ten of the twelve best players of the world. Overall Anand has been ranked world no 1 in 2007 and 2008 and for a brief period in 2011. Anand won the FIDE rapid chess championship in 2017 and subsequently, he is considered the finest rapid chess player in the world. Anand is the only player till now to have won the world chess championships in the tournament, match and knockout formats as well as rapid time controls. Legendary chess grandmasters regard Viswanathan Anand to be one of the greatest players to have ever played the game. Says FIDE president Alexander Grischuk, 'Anand has always struck me as the strongest player of chess, of course after Gary Kasparov.' Lubomir Kavalek describes Anand as one of the most versatile players he has ever witnessed. The one thing that characterises Anand's game is the speed with which he plays. It is this lightning quickness in thinking and making moves that usually baffles his opponents and goads them into making blunders. No wonder he is a brilliant rapid chess player. Anand has several awards under his belt. Notable among these are the Arjuna award (1985), Padmashri (1987), Rajiv Gandhi Khel Ratna Award (1991- 1992) and the Padma Bhushan (2000). As regards Anand's personal life he married Aruna in 1996 and has a son Akhil who was born in 2011. Anand is the first international star in the game of chess from India. Chess is a game that originated in India and migrated to other countries. 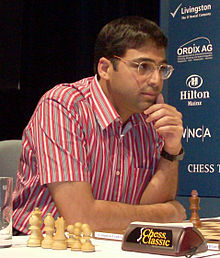 Anand is the first Indian who has brought accolades to India in a game which originated in India. It was only after Anand's phenomenal successes in the international arena that more youngsters began taking up the game of chess and consequently bringing more accolades. Let us hope the trend continues. I am glad my posts will serve as a learning experience for your son. I will definitely include some of the sportspersons you have mentioned. Thanks for visiting. Thanks for visiting Suhasini. Hoping to read some mind blowing mythological stories on your blog. Interesting read Jai and I think this is going to be an educational and inspiring theme throughout. Thanks for visiting Namratha. Yes, I hope my posts serve as a lerning tool for everyone. I missed your theme reveal post Jai or I would've been here much sooner. Knowing and celebrating sportspersons and their achievements through your blog is a brilliant idea. Anand has made India proud on several counts and it was indeed a pleasure to read about him. Thanks for visiting Varsh. Actually I thought up of the theme at the last minute when I decided to participate after a lot of hesitation. I will be visiting your blog soon. I will try and bring in stories of as many interesting sportspersons as possible. He is an inspiration for us! Whenever I saw him playing I found him very calm and balanced. I found the theme very interesting. You are correct. Anand has always been appreciated for maintaining his equanimity even when he was the champion. He is always humble and balanced. A real role model for young aspiring sports-persons. Thank you Shreelekha. Thought up of the theme at the last minute. Glad you liked the post. Thanks for visiting Vartika. I definitely hope you find some of your favourites included in my posts. There will of course be a few people from some time back who are largely unknown to the younger generation. I really feel that in addition to the current favourites some names of past sportspersons who were great achievers should also be included. A for Anand which also means happiness. you have begun this challenge on a good note. I kept abreast of Anand's achievements through newspapers. Yes, he is an outstanding achiever of my generation. Thanks for visiting. i love chess and anand was my role model. i had his picture cut out of magazine. i played chess in school, collages and won most of the time just because of him. looking forward to read more about sports here. I loved chess but my concentration powers were never too good and that usually let me down when I played the game. Chess requires intense concentration and good chess players are riveted to the board completely oblivious to everything else. Good for you that you are a good player. Thanks for visiting. Good to know more about the usually media recluse Vishwanathan Anand. Good choice of theme, Jai. Yes, I remember those games with Vladimir Kramnik too. But I have not gone into specifics because there were too many. I kind of decided to summarise Anand's accomplishments. I have not gone into too many technical details like opening games and si on as not too many people understand those things. And yes Anand's rapid game proficiency may have affected his classical game. Thanks for visiting and such an incisive comment. Thank you so much. Priyanka. He is an amazing role model. One of the most underrated sportsperson of the country. Thanks for visiting Manas. I will be reading your post soon. A lovely post. I was unaware of so many facts about grandmaster. I love your theme as well. Looking forward to read your posts. Thanks Shubra. Hope to be able to come up with more interesting posts. What an interesting theme, V. Anand is someone to look up to as an inspiration and perseverance. I am saving this to share with daughter who has a project in school on the grandmaster. Thank you so much Dipika. Glad to know it is of educational value for your daughter. Hope to bring more posts of a similar nature. I love your theme and good to know about Vishwanathan Anand. Looking forward to know about other personalities. Thanks for visiting and I will try to bring in as many interesting personalities as possible. Hello Jai , Sports is an interesting theme. Your choice of Vishwanathan Anand for the 1st post is bang on as most of us Indians idolize him. Thanks for writing such a wonderful post with details . Yes, we all do love Anand don't we. And he is the person who put India's name on the international arena as far as chess is concerned.